LEN - www.lankaenews.com | President Gamarala‘s Rs. 540 million bribe taking..! His chief of staff and timber Corp. chairman collect Rs. 20 million as down payment -caught red handed !! (Lanka-e-News - 03.May.2018, 11.30PM) The two officers who were nabbed while collecting a bribe of Rs. 20 million at the Colombo Taj Samudra hotel this evening are most close cronies of president Pallewatte Gamarala , and this criminal transaction has taken place with the aiding and abetting of the president himself , based on reports reaching Lanka e news. 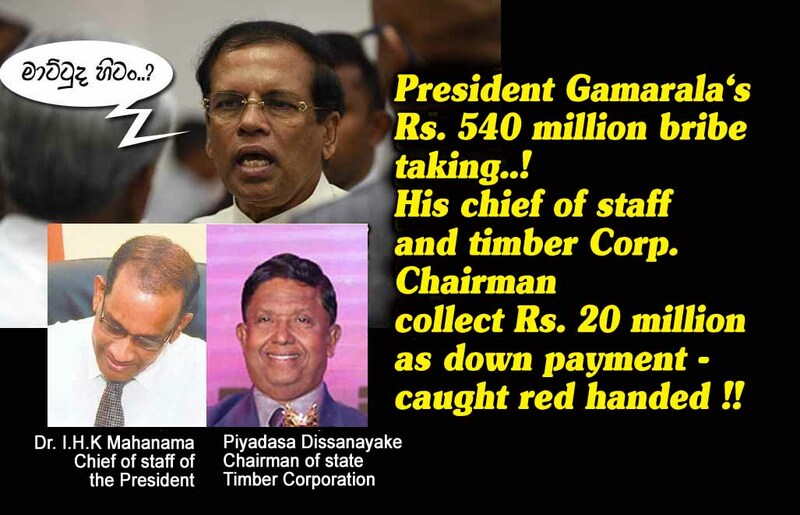 The two culprits are : none other than Dr. I.H.K Mahanama the chief of staff of the president and Piyadasa Dissanayake the chairman of state Timber Corporation which is under president Pallewatte Gamarala. Mahanama and Dissanayake have collected the bribe promising they would obtain the necessary cabinet approval through president Gamarala to entrust the Kantalai sugar factory to an Indian businessman. They have demanded a sum of Rs. 540 million as the bribe to be paid to the president . However that sum was later reduced to Rs. 100 million . It is while they were collecting a sum of Rs. 20 million as an advance they were nabbed by the Bribery and Corruption commission officials this evening. When these two bosom pals of Gamarala were gleefully and blissfully counting the bribe a second time to make sure everything was properly collected their hands were held and arrested. Their ecstasy turned into agony instantly. It is very evident that the president is involved in this illicit deal because the two officers cannot secure the cabinet approval , and that is possible by the president only. It is obvious officers do not stick their neck out this far and risk their high posts to reach out for this huge bribe unless they know they have a backing , and the loot has to be shared with the one who is backing . Hence it is very clear these two bosom pals of Gamarala have taken this bribe with Gamarala’s aiding and abetting. If president Gamarala has any sense of shame he should resign at once. It is Lanka e news first with the news and best with the views which exposed earlier on the illicit commission collection deal for the first time of president Gamarala on the Russian warship purchase. It is again Lanka e news which stands by the truth and champions the cause of truth which exposed how Gamarala’s son in law who just had a photo studio became a multi millionaire , and about his billionaire lifestyle wearing clothes and wristlets worth millions of rupees while the people of the country are in abject poverty. Gamarala who was provoked over these daring and truthful exposures being unable to defend himself banned the Lanka e news website within Sri Lanka unlawfully to conceal his rackets and perfidies. In today’s criminal bribery transaction too Gamarala moved heaven and earth to suppress it , but because Lanka e news reported this incident first and foremost , his efforts proved futile. The entire country should salute the bribery and Corruption commission officials for their bravery integrity , honesty and patriotic fervor. It is because of such true patriots , it became possible to nab the traitors irrespective of their position , influence and powerful presidential backing.